The talented actor Shaheer Sheikh who was last seen as Salim in colorstv show Daastan-Ae-Mohabbat Salim Anarkali has bagged a new role as Abir in the star plus spin-off show Yeh Rishtey Hai Pyar Ke. Yeh Rishtey Hai Pyar Ke is a new generation love story that focuses on #KyonJhatpatShaadi. Shaheer Sheikh is male lead as Abir while Tu Suraj Mei Saanjh Piya Ji fame actress Rhea Sharma is the female lead of the show. The makers are not leaving any stone unturned to promote the show in all the possible attractive way to gain the attention of the viewers. To fetch the interest the makers have roped famous singer Badshah and other star plus popular characters to awfully promote it. While its just 2 days left for the show to unveil its first episode the actor Shaheer Sheikh is gaining all the wishes and good luck from their friends and fans. In the count of wishes, his co-star from Mahabharata the very handsome hunk Saurabh Jain has showered his wishes to him. Shaheer Sheikh has posted a reminder tweet on his twitter to note down the premiere date of his show to which Saurabh Raj Jain has commented “Wish u all d luck bro with the thumb up and hug emojis” and in return Shaheer retweeted him with a hug n kiss emoji. 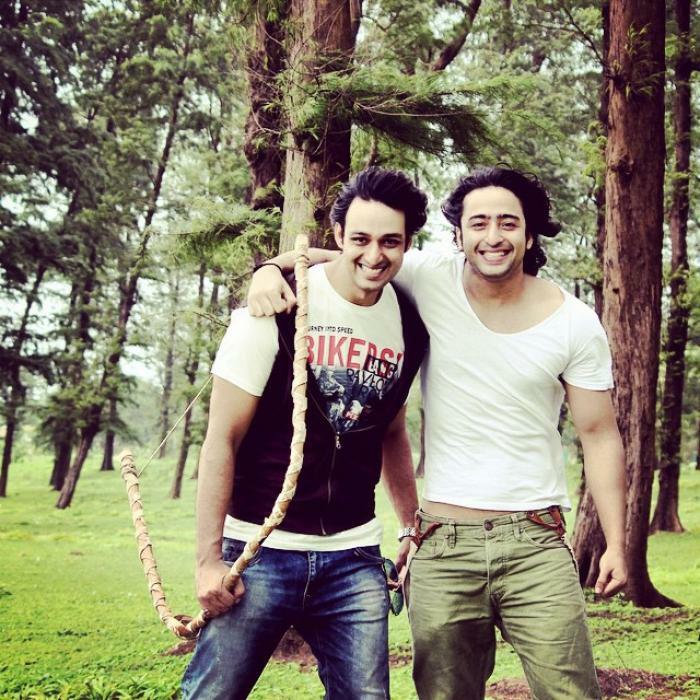 Shaheer Sheikh and Saurabh raj Jain shares a strong bond from the time of Mahabharata. In the mythological series Saurabh Raj Jain played the role of Lord Krishana while Shaheer was in the character of warrior Arjun. Before him Ishqbaaz fame actor Nakul Mehta too posted an awful message stating “ passing the baton on to my friend & one of the biggest stars we have on TV,today @Shaheer_S ! Own the 10pm slot and make a kickarse show”. Passing the baton on to my friend & one of the brightest stars we have on TV, today @Shaheer_S ! Own the 10 pm slot and make a kickarse show. Shaheer Sheikh and Rhea Sharma starring show Yeh Rishtey Hai Pyar Ke is going to go on-air from 18th March at 10pm on Star Plus and Hotstar. Do let us know how excited you are for this show in the comment section. Team Tellyexpress too wishes Shaheer Sheikh and all the stars of the show a very Good Luck for their new start!